No sooner had I settled into bed one evening than the phone rang. It was our neice Diana, all excited about what she was seeing on television, specifically “Who do you thing you are?” on The Learning Channel (TLC). The program tease was something to the effect that popular Hollywood actress Katey Sagal has Amish roots in our Somerset County. I must confess that while I remember Al Bundy from the TV series “Married with Children,” I couldn’t have told you the wife’s name, on the show or in real life. Likewise, I wasn’t familiar with her other professional accomplishments. Some of Diana’s enthusiasm must have rubbed off on me through the phone because I couldn’t get back to sleep that night. I got out of bed and headed for the computer. Fortunately, I was able to find most of what I needed through Google and print it out before going back to bed. Wouldn’t you know it, the next morning I received an e-mail from my wife Susan’s Wyoming cousin Cindy, equally excited about having seen the show and knowing that she too is related to Katie Sagal. After breakfast I got back on the computer and found some additional biographical information, but more importantly, several clips from the show. We don’t get The Learning Channel, nor could I find the entire program on Roku, our streaming service, but I hurriedly shared what information I had with Diana and Cindy. About a week later one of Susan’s high school friends and distant cousin, Karen, eagerly said that she too had seen the show and wanted in on the information. More recently, other of Susan’s relatives have informed us that they too had watched the episode. I had no idea that such an obscure series, one about genealogy no less, had such a following. So, now that some time has passed since the show aired and I’ve done some additional research, I conclude that Katey Sagal and Susan, as well as Cindy, Karen, and the other relatives are bona fide cousins, albeit very distant. Not only that, but there are as many as five chains of connections over the 250 years between the their seven-times great grandfather Jacob Hochstetler, Jr. (1704-1776) and the 21st century cousins. In this article I’ll briefly tell you what I know, show you a few of those family lines in writing, and link you to my sources. 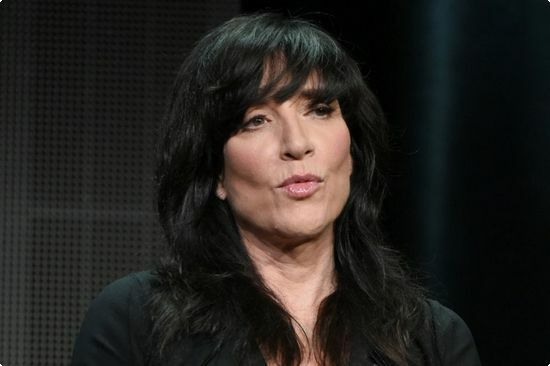 Catherine Louise “Katey” Sagal was born in 1954 in Los Angeles, one of five children to a show business couple: director Boris Sagal and performer “Sara Macon” Zwilling. Their home was in Brentwood, unfortunately associated with an athlete-entertainer bad boy, O.J. Simpson. Her Ukranian-born father Boris died tragically in 1981 in an accident on the set of the TV-movie World War III. 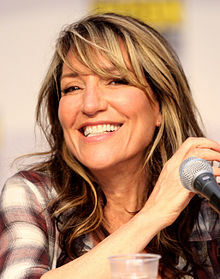 Katey’s godfather is an American sit-com household name, Norman Lear, and Jewish as was her father. Katey claims no “formal religious experience,” but is rather only “culturally Jewish,” according to Wikipedia. The recent TLC program featured Katey’s mother, who began as a child radio star, singing with a USO-produced show during World War II. A writer and producer, she died of heart disease. When introduced to one of her mother’s singing partners, Katey was filled with emotion, saying, “I never met anyone who knew my mother.” But we’ll talk about the best part, the Amish roots, in a minute. Katey is a graduate of the California Institute of the Arts, and her accomplishments are many: winner of a Golden Globe for the FX production of Sons of Anarchy (2011), the voice of Leela in the sci-fi cartoon Futurama (1999-2003), and starring with John Ritter in 8 Simple Rules (2008-2013), to name a few. Her TV credits include episodes of Columbo, Mary Tyler Moore, Tucker, Lost, and of course, the decade-long running Married with Children, in which she played the infamous Peg Bundy. 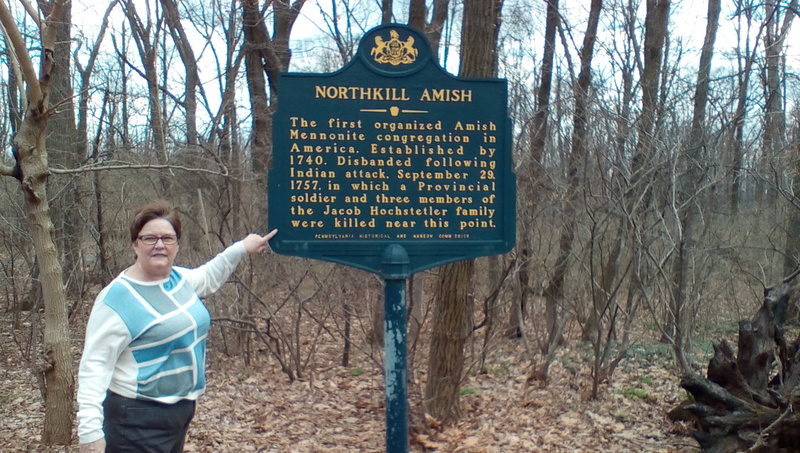 Katey uncovers the harrowing story of her Amish seven-times great-grandfather, Jacob Hochstetler, whose family was caught up in tensions between Native Americans and Colonial settlers. Katey learns that Jacob remained true to his pacifist beliefs and refused to bear arms against his assailants. You can read all about what has become known as the 1757 “Hochstetler Massacre” at this site. The incident was part of the French & Indian War. Jacob’s wife Anna was killed and scalped along with a son and daughter. The family cabin was burned to the ground. According to the story, Jacob and sons Joseph and Christian were taken captive but either escaped or were released. As we’ll see, My wife Susan is a direct descendant of Jacob and another member of the Berks County Amish community, Hannes Miller. He became known as “Indian John” from a wound he received as the raiding party was retreating. Virtually all of that Amish community soon emigrated west to safer havens like Lancaster and Somerset Counties to escape both the ethnic unrest and the threat of enlistment by the Colonial powers. Katey and the production crew visited both the Berks County History Center in Reading and the site of the Hochstetler misfortune in Tilden Township. Susan and I did the same during a recent trip East this spring. Now, as I promised, the family tree that includes Katey Sagal and Susan Miller Pearce. Below are what I call “Chain 1,” the most direct common lines between Jacob Hochstetler and the 21st century cousins that we might call the “Sibling association,” and “Chain 2,” which I refer to as the “In-law linkage.” Both chains begin with the two common generations of Jacob Hochstetler to Christian Stutzman. We’ll discuss three other less-direct connections later, which we may refer to as “Cousin connections.” Chain 1 separates after Christian Stutzman with his daughters Veronica and Mary: Mary Stutzman m. Peter J. Miller, son of Hannes “Indian John” Miller, grandfather on both Susan’s maternal and fraternal sides. The Millers moved from Berks to Somerset County and this is where Katey’s and Susan’s lines separate. Katey’s Abraham Miller married Maria Saylor and Jacob A. Miller married Rebecca Horner. We pause here to say that Susan has distant cousins from both these early Somerset County Saylor and Horner families, which suggests those three additional “Cousin connections” mentioned above. Katey’s final four generations took her ancestors from the American Mid-west to the West Coast. Katey’s Peter J. Miller who married Mary Stutzman, had a brother, Christian Miller, nick-named “Glades” for the east-central part of Somerset County containing the family homestead, and from there Chain 1 shows several arguable links to Susan. Research is ongoing to confirm what we believe. 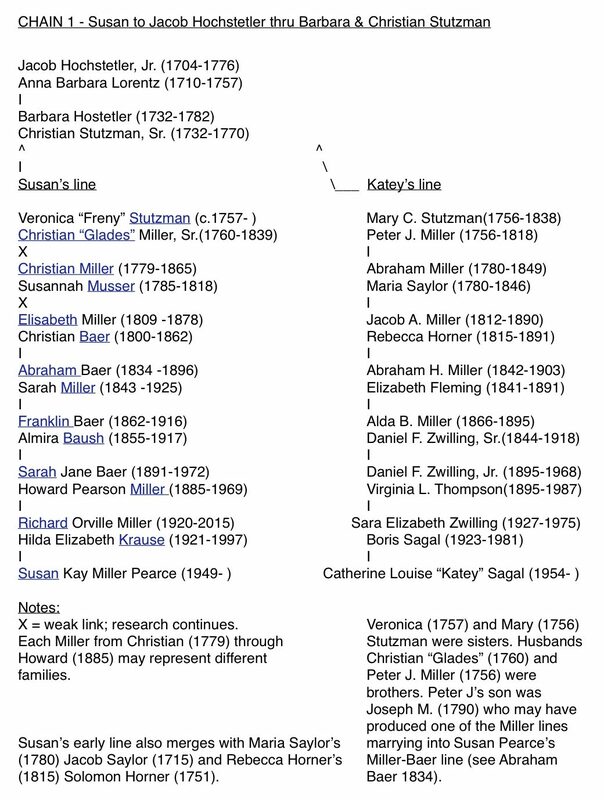 What is especially interesting (see notes) about Susan’s Miller-Baer families is that the Millers may have come from at least three different ancestral lines, all within as few as four generations. 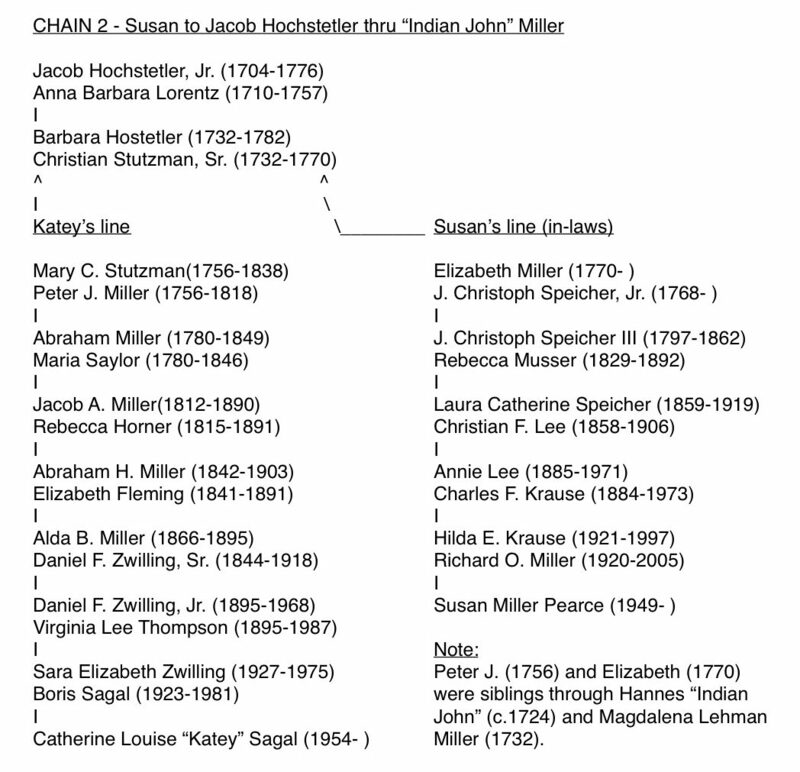 In conclusion, the most direct connection from cousins Katey Sagal and Susan Miller Pearce to seven-times Great-grandparents Jacob and Anna Hochstetler is labeled above “Chain #1,” but unfortunately, it contains several weak links on Susan’s side. However, with three additional possible chains involving Peter J. Miller’s ancestors and Susan (see notes on each chain) and what I call the “In-law linkage” involving Peter’s sister Elizabeth (see Chain #2), I think it’s safe to say that Katey Sagal and Susan Miller Pearce are distant cousins, both descendants of Jacob and Anna Hochstetler of the 1757 Berks County “Hochstetler Massacre” fame. Our research into those confessed connectional weakness on Susan’s side will continue, and perhaps one day we’ll be able to share definitively who the mystery Millers are.